This strangely mis-titled show at Somerset House includes only a handful of photographs by the great French photographer and, in a sense, isn’t really about colour either. 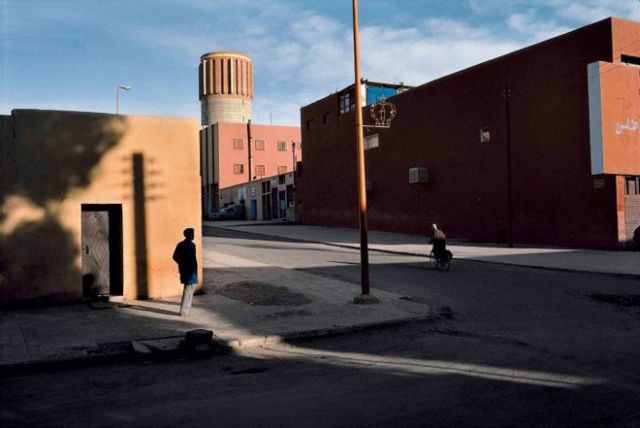 The connection with Cartier-Bresson is this: firstly, that he once wrote somewhat disparagingly about colour photography; and, second, that he coined the term ‘the decisive moment’. When Cartier-Bresson made his remarks about colour photography it was 1952 and the medium was still in its early years of development, and his thoughts about the use of colour were based on the technical problems associated with shooting in colour (the film was too slow and usually required needed artificial light, so goodbye to decisive moments) and the aesthetic limitations of colour reproduction at the time. In the same essay he did admit that colour photography was in its infancy, and there was no knowing how it might develop. No truer word was spoken. These days, in anyone’s hands, digital cameras and smartphones can seize something that happens and capture it in the very moment that it takes place. And everything in high-definition colour. 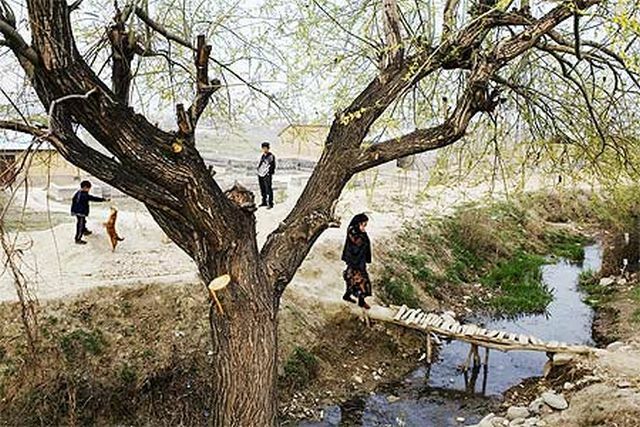 What Cartier Bresson: A Question of Colour aims to do is show how photographers in the last thirty years or so have adopted and adapted the Cartier-Bresson’s adage of the ‘decisive moment’ to working in colour. This large exhibition, which I saw when in London a couple of weeks ago, includes more than 75 works by 14 international acclaimed photographers, regarded by the curator as having demonstrated the ability to capture that brief moment, as Cartier-Bresson put it, when meaning crystallizes in a situation, revealing the order underlying apparent chaos – and to do it in colour. ‘Black and white are the colours of photography’, Robert Frank once remarked. But, as the technology of colour photography and printing began to improve, photographers began to sense that black and white were not the colours of reality, that black and white presented too large a gap between real life and image. 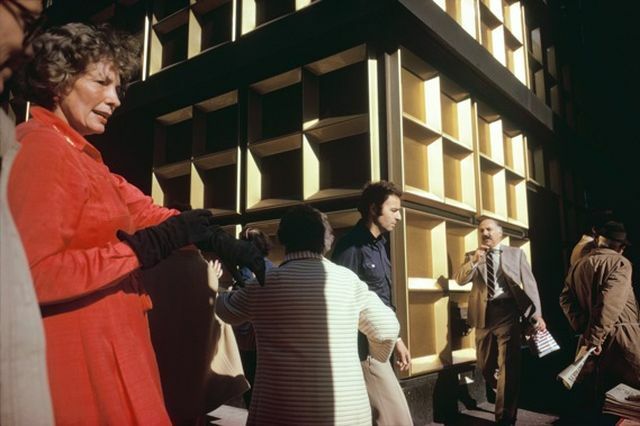 The resistance to colour lasted until the late 1970s, then, in 1976, the legendary John Szarkowski filled MoMA with the colour photography of William Eggleston, and the world of photography was revolutionized. At least in respect to colour. Like much of the work of American photographers at the time, Eggleston’s images were about ‘the aesthetic potential of the commonplace’ (Gerry Badger). But they would not have worked in black and white. Cartier-Bresson is hailed as having laid the foundations for the development of documentary and street photography – which is the genre to which most of the photographs in this exhibition belong. The Cartier-Bresson photos exhibited here all date, with one exception, from the late 1940s. They were taken in America and have never been exhibited in the UK, though they have been published. They represent a turning point, when the photographer moved from a highly personal ‘surreal’ approach down the path of professional reportage. 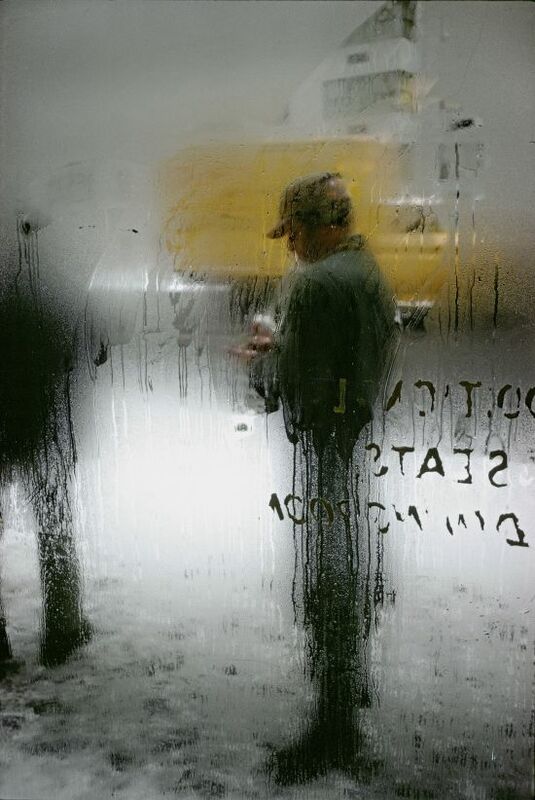 One of the earliest photographs here is the wonderful, painterly Snow, taken by Saul Leiter in 1960. Leiter’s early work in the 1940s and 1950s was an important contribution to what came to be known as The New York School. He began taking colour photographs as early as 1948, and MoMA’s 1957 conference ‘Experimental Photography in Colour’ featured 20 colour photographs by Leiter. 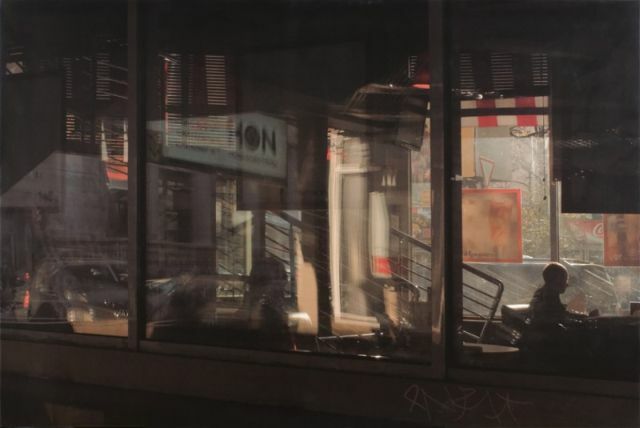 His abstracted forms and radically innovative compositions have a painterly quality that stands out among the work of his New York School contemporaries, perhaps because Leiter has continued to work as both a photographer and painter. 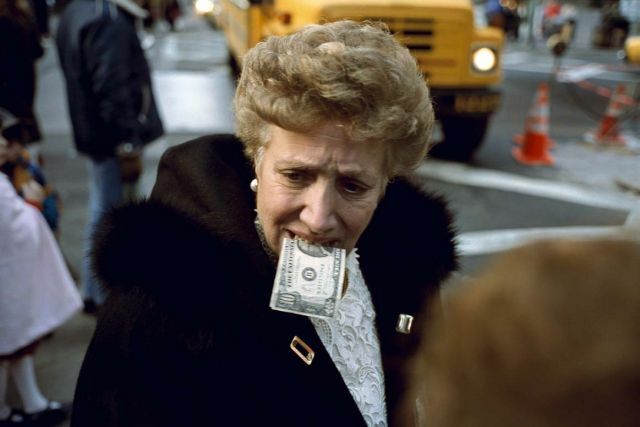 But Leiter’s personal colour photography was, for the most part, not shared with the public (he was better known as a successful fashion photographer in the 1950s and 1960s). But throughout those years Leiter continued to walk the streets (mostly New York and Paris), making photographs for his own pleasure. He printed some of his black-and-white street photos, but kept most of his colour slides tucked away in boxes. It was only in the 1990s that he began to look back at his colour work and start to make prints. 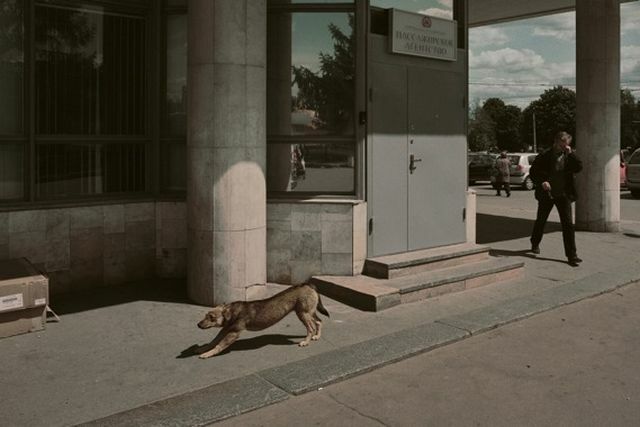 Fred Herzog’s story is similar. Born in Germany, but living most of his life in Canada, Herzog’s work was centred primarily on the lives of working class people in Vancouver. Because he worked primarily with Kodachrome slide film, he was marginalised as an artist in the 1950s and 1960s. It is only in the last decade that his work – such as 1984’s Crossing Powell here – has received significant critical attention. 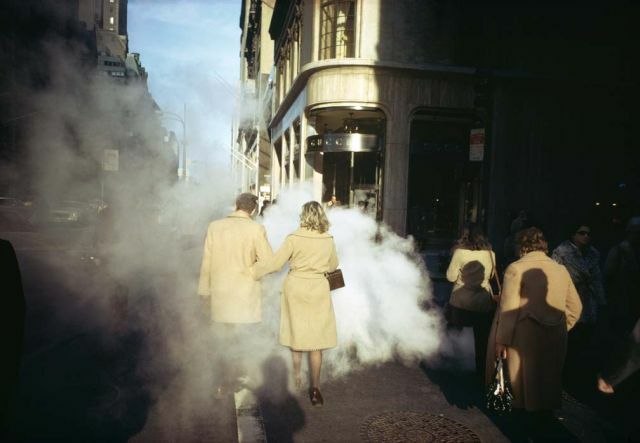 Joel Meyerowitz is a renowned street photographer who began photographing in colour in 1962 and was an early advocate of the use of colour at a time when there was significant resistance to the idea of colour photography as serious art. 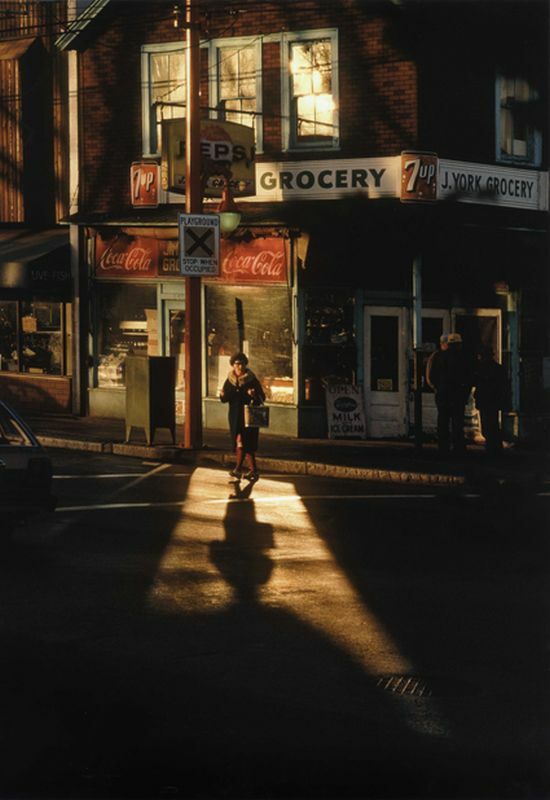 Meyerowitz is a key figure in street photography, and has been instrumental in changing the attitudes toward the use of colour photography, so it is appropriate that he represented here by two of his classic images. 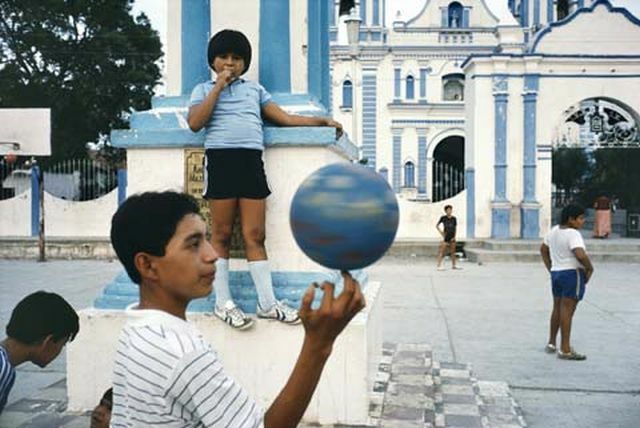 Alex Webb is another key figure in street photography. 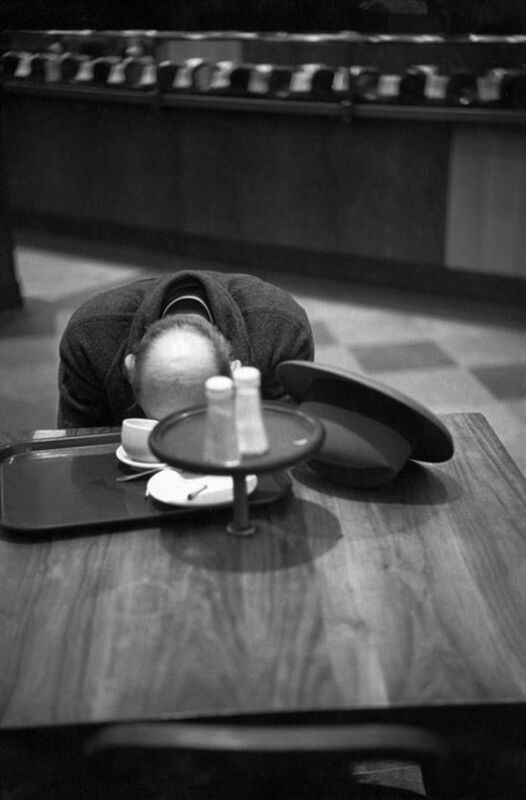 In 1976 he became an associate member of Magnum and went on to document small-town life in the American South. He also did some work in the Caribbean and Mexico, which led him, in 1978, to begin working in colour, as represented in this exhibition by his image from Tehuantepec in Mexico. I only know how to approach a place by walking. For what does a street photographer do but walk and watch and wait and talk, and then watch and wait some more, trying to remain confident that the unexpected, the unknown, or the secret heart of the known awaits just around the corner. 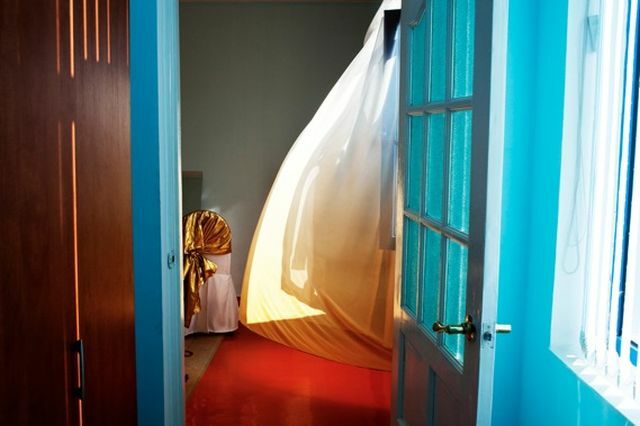 The Belgian, Harry Gruyaert is another Magnum photographer renowned for his colour reportage. He is represented here by an image from a 1986 Magnum portfolio compiled in Morocco. My process is linked to everyday life. Only on rare occasions do I go out specifically to ‘shoot’. My best photographs were taken going to or from work, or some other destination. Sometimes a picture appears that helps me sum up a strange mood or thought that I’ve struggled with for weeks. Other times my work is more documentary in nature. Photographing in public keeps me awake and aware, always looking around, in awe at what we humans are up to. In a time when staged narratives and rendered images are popular, I am excited by the fact that life itself offers situations far more strange and beautiful than anything I could set up. Trente Parke is an Australian photojournalist who joined Magnum Photos in 2002. 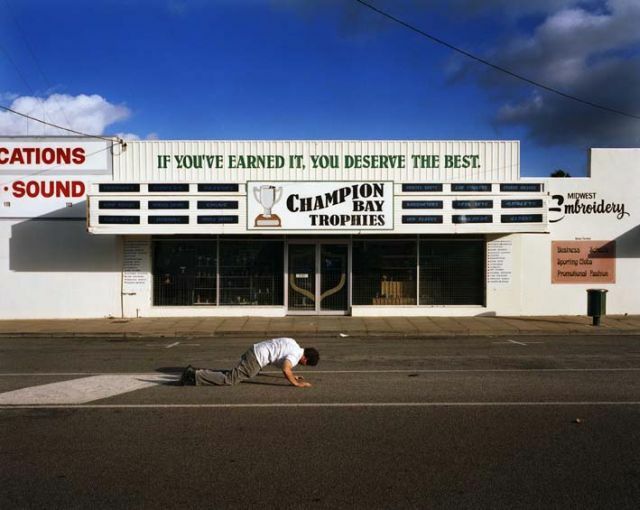 His series Welcome to Nowhere, from which Man Vomiting is taken, focused on Australian small towns, capturing arresting images with strong colours and a formal composition, that convey a sense of stillness that is almost surreal. 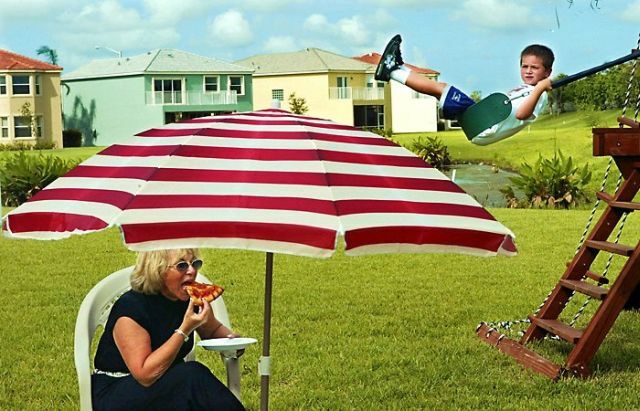 The humour of Man Vomiting seems to testify to Parke’s ability to capture unforeseen moments and juxtapositions. Karl Baden photographs like a drive-by shooter, through the side window of his car. 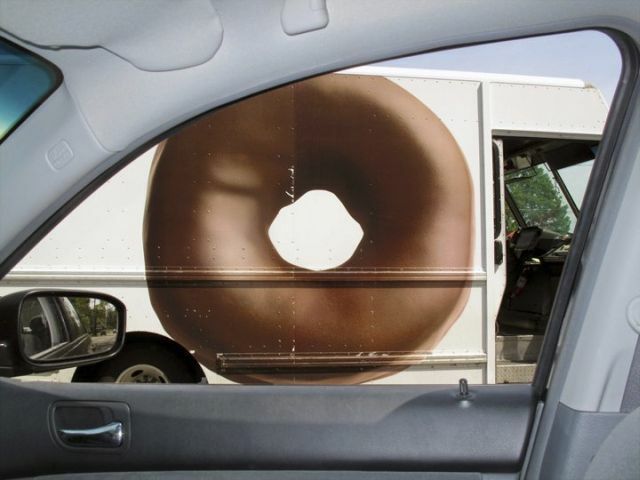 Among several of these images included in the exhibition is this one, captured when a van with a huge bagel painted on its side, drew up alongside. Baden employs supersaturated colour that grabs your attention. Boris Savelev is a Russian photographer born in Ukraine in 1948. He started out as an aerospace engineer, but has made his name in photography since 1976. Savelev uses colour very differently to the previous two photographers. In his images, colour is unsaturated and seeps and spreads through light itself. 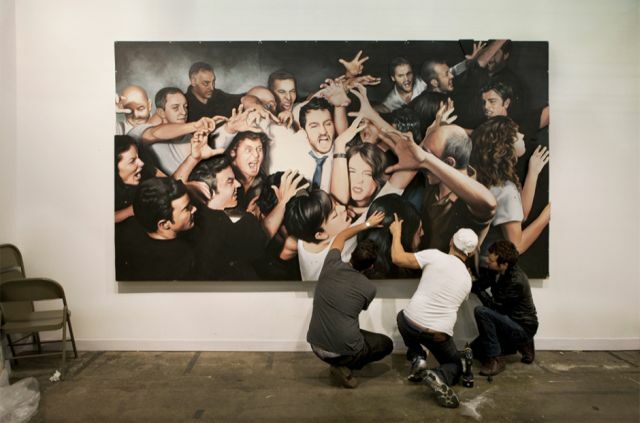 Perhaps the most immediately eye-catching images in the exhibition were those by Andy Freeberg. 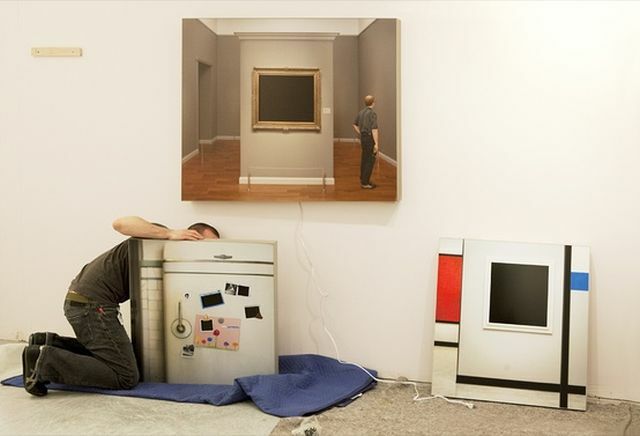 They are taken from his series Art Fare, and, in a bizarre and hilarious mix of two dimensional art on the wall and three dimensional people, document the world of collectors’ art fairs. 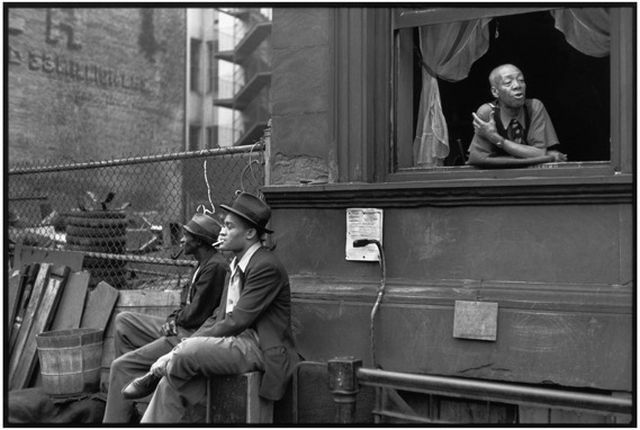 It is quite reminiscent of Cartier-Bresson in content, but also by virtue of its exquisite composition. While in colour, colour is neither what “makes” it nor something that “gets in the way” of the photograph, it simply adds to it. It comes alive the way that great photos do, with the viewer’s gaze contently bringing various parts to the forefront, supported by perfect harmony with that which recedes. It is one of the most immersive to look at in the entire exhibition. 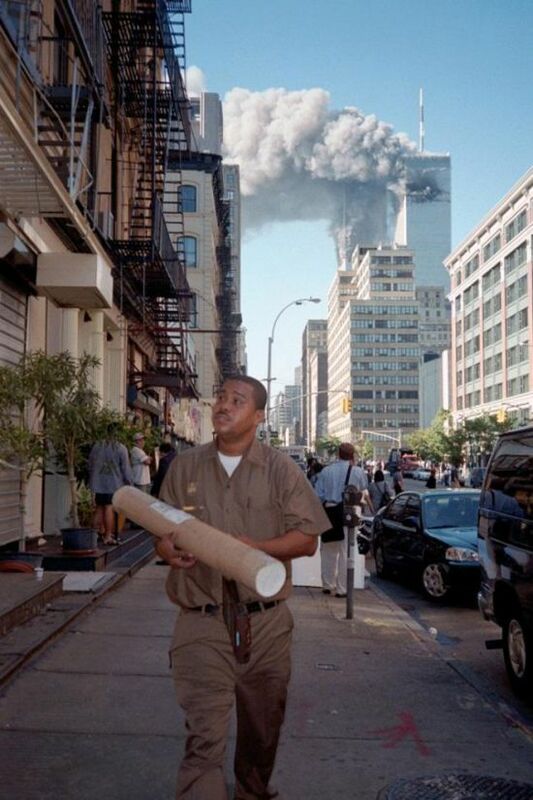 Finally, I’m return to Melanie Einzig, for an image that, it seems to me, captures a decisive moment in more ways than one: on that fateful day in Sepember 2001, a courier pursues his daily round as, behind him, the world changes decisively. ‘Colour is for painters’, Cartier-Bresson once said. You might say that this exhibition disproves that statement. Gorgeous post, a visit to a dream gallery with a brilliant guide. The final image carries us to Breughel, Auden, and Williams, doesn’t it.